Special prices for state-run schools; please ask! 1. The working continuity tester often accompanies a person for many years, as an extremely important and meaningful tool. 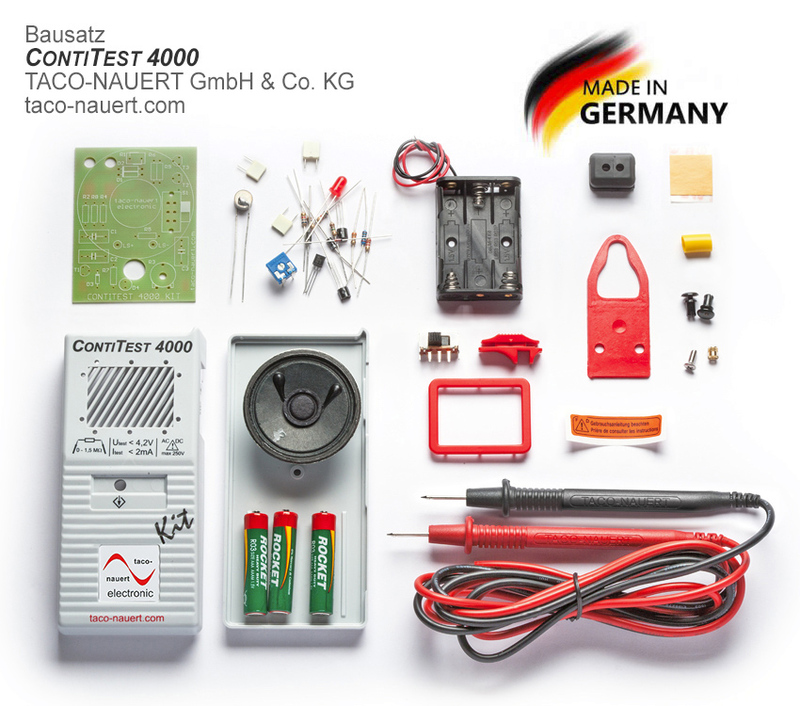 This holds true whether the person regularly tests components (such as incandescent bulbs, fuses, switches or electronic components) in a professional capacity; or the continuity tester is only occasionally needed for personal use, e.g. to install a car radio. 2. The aspect of conveying knowledge should not be neglected. Our detailed curriculum explains how to deal with parts used to assemble equipment. In addition, the lessons provide background theory on how the components (such as flip-flops, amplifiers and the tester's protective circuit) function, resulting in very usable knowledge about basic circuits. CONTITEST 4000 indicates continuity optically with a red LED and acoustically via a speaker. However, the speaker can be disabled with a switch. Delivery includes: All required components, such as PCB, housing, speaker, all electronic and mechanical parts, battery, etc., with assembly and instructional manual. Lesson documents: a detailed description of the teaching concept, with the option of downloading the documents can be found here: Free download here. The assembly instructions and the teaching concept for practical work in electronics. Discounts for large quantities and special prices for state-run schools; please ask!